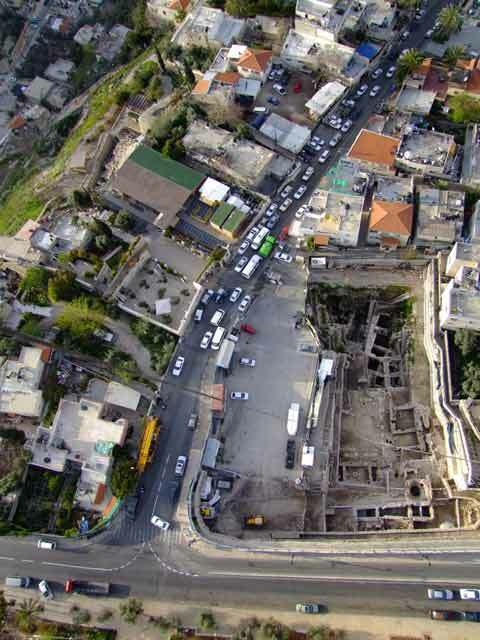 From February to December 2008 and January to October 2009, excavations were conducted in the northwestern quarter of the City of David parking lot (Giv‘ati Parking Lot; Permit Nos. A-5337, A-5569). The excavation, undertaken on behalf of the Israel Antiquities Authority and underwritten by the El‘ad Association, was directed by D. Ben-Ami and Y. Tchehanovets, with the assistance of N. Ben-Ephraim, A. Zilberstein, D. Gottreich, A. Shatil, M. Krakovsky, S. Bachar, D. Tan‘ami and F. Corbin (area supervision), V. Essman, M. Kunin and M. Kipnis (surveying and drafting), T. Sagiv and A. Peretz (field photography), Skyview Company (aerial photography), N. Zak (drafting), C. Amit (studio photography), D.T. Ariel and G. Bijovsky (numismatics) and the personnel of the Artifacts Treatment Department (IAA). 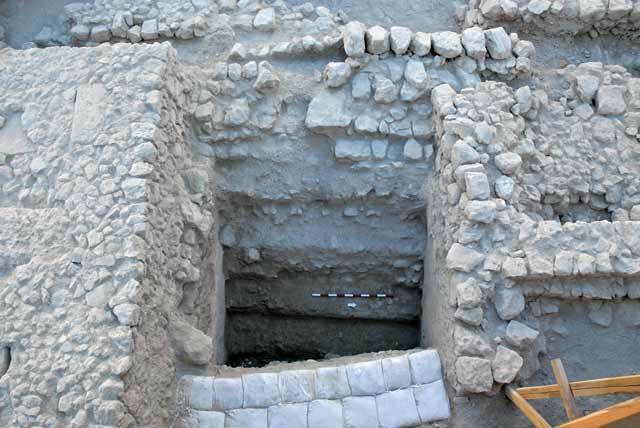 Students from the Institute of Archaeology of the Hebrew University of Jerusalem and other academic institutions, as well as volunteers from abroad, took part in the renewed excavations. The excavation area is located on the northwestern side of the City of David spur, along the eastern fringes of the Tyropoeon Valley, which delimits the spur from the west (Fig. 1). The excavations in 2007 focused on the southwestern quarter of the Giv‘ati Parking Lot (Area M1), where it was possible to evaluate the stratigraphic sequence and the periods represented in it (HA-ESI120). Stage 2 of the excavation project has begun in February 2008. The excavation area, enlarged to the north, was now located between the end of Area M1 in the south and the road that runs alongside the Old City wall in the north. Remains dating to the Early Islamic, Byzantine, Late Roman and Early Roman periods were exposed in this area (M2), which is scheduled to become a visitor’s public attraction at the conclusion of the excavation; therefore, the exposed architectural remains have not yet been dismantled. This stage of the excavation ended with the exposure of Early Roman-period remains. The current excavation provided an opportunity to re-examine the conclusions reached in the previous season; with the added information, it was possible to draw a comprehensive picture of the settlement layout in this part of the city during the first–tenth centuries CE. Generally, the architectural remains reflected the importance of the area in the urban network during the periods represented in the chronological sequence. On the one hand, this is evidenced by very large buildings and on the other, by the lack of plain dwellings. The somewhat inferior topographic location of the area along the slope of the City of David, contributed greatly to the preservation of the architectural remains. The walls of the buildings were preserved to a considerable height, sometimes in excess of 3 m. The remains are described below chronologically, from the latest to the earliest. As in Area M1 to the south, here too the later architectural remains dated to the Early Islamic period and included phases from the Abbasid period and an additional phase that dated to the Umayyad period. This stratigraphic picture is an important contribution to the settlement history of the Early Islamic period, as known to date from the excavations in the City of David (D. Bahat 1987. The Physical Layout, in J. Prawer (ed. ), The History of Jerusalem, The Early Moslem Period 638–1099, Jerusalem, pp. 32–79; R.A.S. Macalister and J.G. Duncan 1926. Excavations on the Hill of Ophel, Jerusalem 1923–1925. APEF IV: 133). The Abbasid period is characterized by a wave of construction that foreshadowed the establishment of a planned residential quarter. Houses were built on either side of a large open area, where the openings of two water reservoirs (below) and other installations were discovered. Many pits that were dug in the early phase contained numerous and varied fragments of pottery vessels (Fig. 2), as well as organic debris. Fish bones and egg shells were two the outstanding finds discovered in most of the pits. Several ankle bones (astragali) of large animals, probably cows, were exposed in one of the pits and bird bones were found in several pits. A surprisingly large quantity of grape pips and legumes were recovered from some of the pits. These finds reinforce the impression that a marketplace operated in this open area, where fish, eggs, fruit and perhaps even meat and pottery vessels were sold. A notable characteristic of the Abbasid construction was the extensive use of plaster, intended to coat the scanty construction of the houses’ walls. Some of the rooms included raised platforms that were joined to one of the walls in the room. Noteworthy is the continued use of the water reservoirs from the previous period. The opening of one ancient water reservoir was raised and its rim was incorporated into the occupation level; someplace else, a room in a Byzantine building was adapted for use as a water reservoir after the ceiling’s vault was rebuilt and a thick layer of hydraulic plaster was applied to its walls (for similar characteristics, see Macalister and Duncan 1926:136–145). During the Umayyad period (seventh century CE), a large limekiln (diam. c. 4 m, depth c. 3 m; Fig. 3), which stood in the western part of the excavation area, was built against the southern wall of a very large building that was destroyed at the beginning of the seventh century CE. Any discussion dealing with the settlement on the City of David spur during the early phases of the Islamic period must necessarily address the question of the possible identification of the Jewish neighborhood in Jerusalem. It can be learnt from various sources that after the Muslim conquest, particularly during the reign of Omar Ibn Al-Khattab, the Jews were permitted to return and settle in Jerusalem for the first time after a long period of absence. A section of the Geniza mentions the Jewish settlement in the south of the city and describes the neighborhood as “the Jewish market to this very day” (M. Gil. 1987. The Jewish Settlement. In J. Prawer, ed. The History of Jerusalem, the Early Islamic Period 638-1099, Jerusalem, pp. 133–162 and references therein). Identifying the location of this neighborhood in the south of the city in general, and on the hill of the City of David in particular, is based on the assumption that the Jews preferred this region because of its proximity to the Shiloah spring and the gates to the Temple Mount (D. Bahat 1987. The Physical Layout. In J. Prawer, ed., The History of Jerusalem, The Early Islamic Period 638-1099, Jerusalem, p. 44). Most scholars agree that the Jewish neighborhood in the Early Islamic period should be located in the northern part of the City of David spur (Bahat 1987), whereas others who wish to be even more precise claim that its location extended “south of the southwestern section of the Temple Mount” (Gil 1987:141). The location of the excavation area, on the northwestern part of the City of David spur and next to the southwestern section of the Temple Mount, as well as the nature of the finds discovered in it, indicate intensive settlement during the Early Islamic period. To date, no accompanying finds that can unequivocally support the identification of these settlement remains with the Jewish neighborhood, have been discovered. This identification is probably corroborated by the Jewish inscription that mentions “Bar Ya’[aqov]”, which was discovered in 2003 by Reich and Shukron when they excavated in the area (HA-ESI 117; Reich, R. 2008. The Giv‘ati Parking Lot, In E. Stern, ed. The New Encyclopedia of Archaeological Excavations in the Holy Land 5, Supplementary Volume, pp. 1807–1808). The inscription joins other Jewish inscriptions of the period that were revealed in the vicinity of the Temple Mount and should be associated with the renewed Jewish settlement at the beginning of the Islamic period. This issue may be further clarified if and when other finds are discovered during the planned expansion of the excavation area in the coming seasons. This period is represented by a large building that was discovered next to the northern boundary of the excavation area (Fig. 4). The excellent quality of the building’s construction far exceeds that of a normal residential structure. 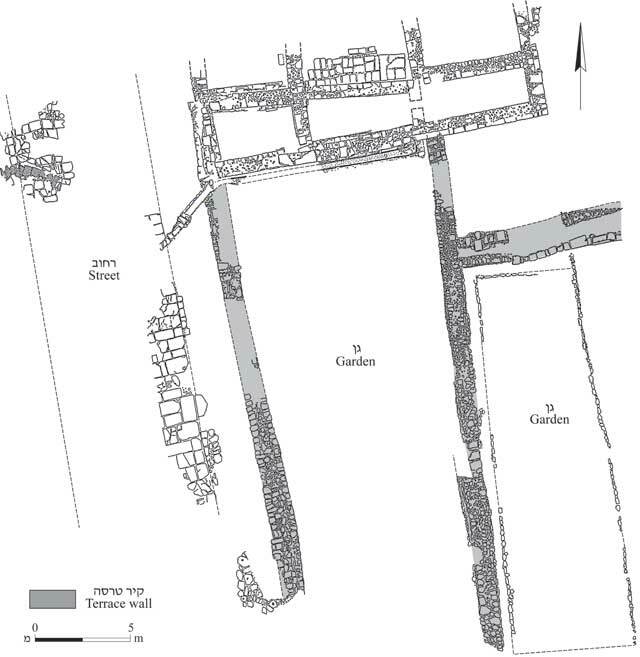 So far, a row of rooms had been fully exposed on its southern side, but it appears that the building extended beyond the northern border of the excavation area and thus, its plan is incomplete (Fig. 5). The space between two broad parallel walls (length in excess of 10 m) in the southern wing was divided into several rooms by perpendicular walls built between them. A barrel vault incorporated in the northern wall bore an inclined stone surface atop it, which was probably an access ramp, leading to the second story. Adjacent to the western side of the building was a street paved with large flat flagstones (average size 0.8×1.0 m; Fig. 6), whose upper surfaces were made smooth from constant use. Curbstones delineated the eastern side of the street, whose western side was mostly located beyond the excavation area. A section of the street’s western side, with the delineating curbstones, was discovered when the excavation area widened slightly to the west. 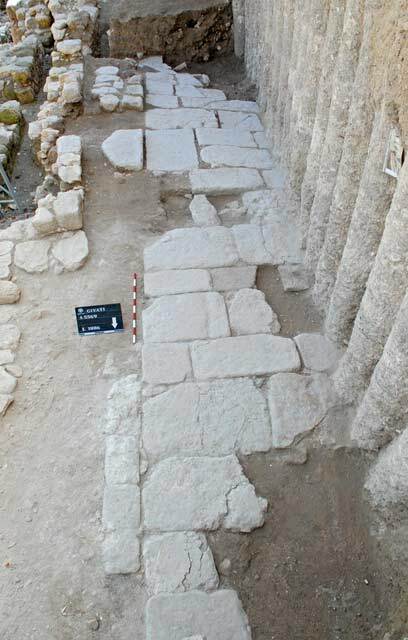 Based on the street’s exposed segment, it was ascertained that the distance between the curbstones on either side of the street was c. 6 m. The street was oriented north–south (exposed length c. 30 m) and sloped gently south, following the topography of the City of David spur. Crowfoot and Fitzgerald had exposed a section of this street in the past, located several dozen meters to the south (Crowfoot J. W. and Fitzgerald G. M. 1929. Excavations in the Tyropoeon Valley 1927 [APEF 5], London, pp. 41–43) and the two sections together represent one of the principal streets of Jerusalem in the Byzantine period (Y. Tsafrir 1999, Topography and Archaeology of Jerusalem in the Byzantine Period, In Y. Tsafrir and S. Safrai, eds., The History of Jerusalem. The Roman and Byzantine Periods, 70-638, Jerusalem, pp. 281–352; O. Gottfeld 2007. The Layout of Jerusalem’s Streets in the Byzantine Period. Eretz Israel 28, pp. 66–78). Although it is currently difficult to determine when the street was built, the time of its final use has been established. The large building exposed next to it had existed during the last phases of the Byzantine period (fifth–sixth centuries CE) and was used at the same time as the street. An unmistakable physical connection between the two exists: a plastered water conduit, which passed next to the southern wall of the building, drained the rain water from its roof and conveyed it westward to the main drainage channel that was beneath the street. A similar picture of secondary drainage channels that emerged from the buildings alongside the street and connected to the main drainage channel beneath it is characteristic of the Late Byzantine phase in Crowfoot and Fitzgerald’s excavations (Crowfoot and Fitzgerald 1929: 41–43). Nevertheless, the removal of some of the street’s flagstones and the construction of meager walls above it during the Early Islamic period indicate that the street was no longer used in this period. The Byzantine period building was ultimately destroyed and the damage it incurred has left its mark all over the structure. The stone collapse of the walls was sometimes piled to a great height and the layer of dark ash that covered the floors reflected the fierce conflagration that accompanied the destruction. A remarkable discovery above the floor of the western room determined the time of the building’s destruction. It was a hoard of gold coins found next to the room’s northern wall, just a few centimeters above the floor, which was sealed with a layer of dark ash. 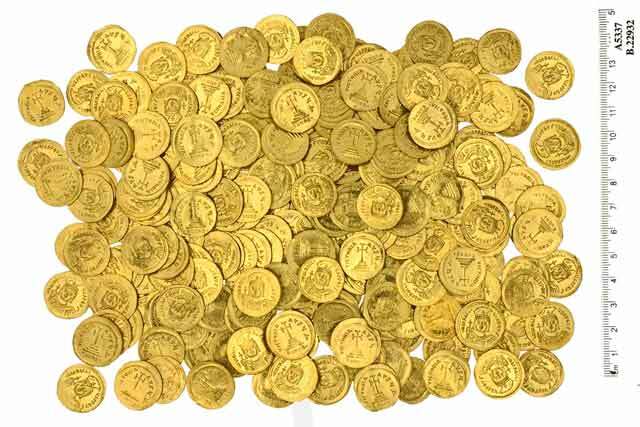 The hoard consisted of 264 gold coins that were found lying one on top of the other (Fig. 7). This setting and the fact that the coins were not found inside a pottery vessel, as no fragments of a pot were discovered in the vicinity of the hoard, reinforces the assumption that they were wrapped in a bundle of organic material that was not preserved. The discovery of the hoard is of utmost importance, far beyond its contribution to numismatic research. A preliminary analysis of the hoard by G. Bijovsky has revealed the following conclusions: First, the large quantity of coins is indicative of its value. In this context, it should be mentioned that the only hoard of gold coins discovered in Jerusalem to date comprised a total of five coins (Amiran, R. and Eitan, A. 1970, Excavations in the Courtyard of the Citadel, Jerusalem, 1968–1969: Preliminary Report. IEJ 20: 9–17). Second, the hoard consisted solely of gold coins and no bronze or silver coins were found among them. It was further ascertained that all 264 gold coins are completely identical and therefore, it can be said with certainty that they were all struck at the same mint. The coins bear the portrait of the Byzantine emperor Heraclius (610–641 CE), during whose reign a variety of gold coins were minted; however, all the coins in this hoard belong to a single well-known type that bears the emperor’s image dressed in military garb and holding a crucifix in his right hand on the obverse and a cross on the reverse. These coins were struck during the early days of the emperor’s reign, between the years 610–613 CE and reflect his youthful image, unlike that portrayed on his later coins. Third, a careful examination of the coins has revealed that they do not bear any signs of wear and in fact, were never in circulation. Not a single coin was added to the hoard to spoil its uniformity; hence, it represents a single absolute point in time. It should not be regarded as a collection of coins accumulated over a long period of time, as is customarily done with other hoards. The coins were intentionally hidden in the building from the moment they were brought in, with the intention to be used in the near future, which was never implemented. The vast area, dimensions of the walls and quality of construction, as well as other architectural features that were found in the ‘House of the Treasure’ indicate that it was far more important than a private residence. This was presumably the seat of a Byzantine official representative in Jerusalem and the gold hoard was earmarked for a specific purpose, such as the payment of salaries, as a contribution or for construction. 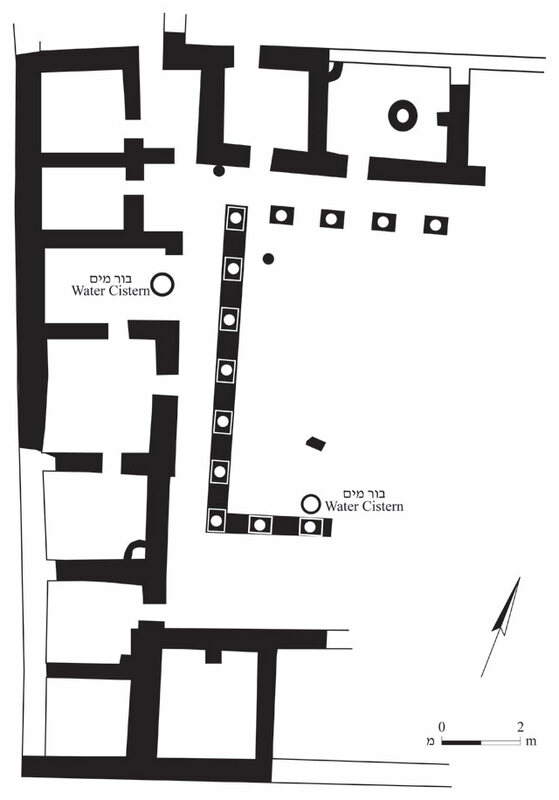 Based on the dating of the hoard to the year 613 CE and the fact that the coins were never circulated, it seems that the destruction of the building should be attributed to the Sassanain invasion of Jerusalem in the year 614 CE, during which the Persian army demolished buildings in the city (Z. Baras, 1982. The Persian Conquest and the End of Byzantine Rule. In Z. Baras, S. Safrai, Y. Tsafrir and M. Stern, eds. Eretz Israel from the Destruction of the Second Temple to the Muslim Conquest, Volume 2, pp. 300–350). Several scholars have identified the remains of the damage wrought by the Persian army with the destruction layers that were discovered at some of the excavation sites in Jerusalem (Schick R. 1995. The Christian Communities of Palestine from Byzantine to Islamic Rule: A Historical and Archaeological Study. Princeton, pp. 332–334, 340, 352–354); however, it should be emphasized that these excavations have not yet provided unequivocal chronological data that corroborates this interpretation (Magness J. 1992. A Reexamination of the Archaeological Evidence for the Sasanian Persian Destruction of the Tyropoeon Valley. BASOR 287: 67–73). It appears that the exposure of the architectural complex, together with the unique hoard discovered in it, whose owner did not return to search for it among the ruins, is a tangible expression of this dramatic event that occurred in Jerusalem at the beginning of the seventh century CE. A large impressive building (exposed area 24×37 m) was erected in this period. It is estimated to have covered a minimum area of c. 1,000 sq m. The building covered most of the excavation area and continued north and east beyond its boundaries. Its position in the stratigraphic sequence and the artifacts discovered during its excavation enabled us to determine the dates of its construction and destruction. These indicate that the structure had been built at the end of the third century CE and was destroyed less than one hundred years later. The building was planned as a peristyle structure (Fig. 8). A large open courtyard (c. 240 sq m) in its center is flanked by a series of rooms. The bases and parts of the monolithic stone column shafts that stood on the stylobate were found scattered throughout the courtyard. Covered stoae were located between the rows of columns and the rooms that bordered the courtyard. To date, seven rooms in the west and four additional rooms in the north were excavated. The residences of this complex of rooms and the wing delineating the courtyard to the east were located beyond the excavation area. One row of rooms was built in the west, whereas the rooms on the northern side were more complex. The northern part of this row was not excavated yet because a later Byzantine structure was built directly above it. Originally, the building’s wings were two stories high and had tile-covered roofs. The ground-floor rooms were coated with plain plaster and their floors were mostly composed of tamped soil. The floors of some rooms were sometimes coated with a thin layer of plaster. A thick layer of white plaster was applied to the walls that faced the courtyard. The ceilings of the ground-floor rooms consisted of wooden beams and were supported by a central stone arch, which rested on a pair of pillars that survived in some of the rooms. The remains of arches were discovered in the building’s collapse. Installations were unearthed in some of the rooms, yet all were devoid of finds so that their nature could not be determined. The walls of the upstairs rooms were plastered and decorated with frescoes. Many fragments of wall paintings were discovered among the ruins in the collapse of the second floor (below). The decoration on the plastered walls was mostly composed of geometric and floral motifs, occurring in shades of red, black, green, yellow and other colors. Among the hundreds of fresco fragments discovered so far, not one figurative decoration had survived. The frescoes’ fragmentary state of preservation makes it difficult to reconstruct the original compositions and their exact location on the walls of the building. A preliminary analysis of the fresco fragments shows that the painted decoration can be divided into two main groups. The first group is represented by decorative motifs that are characteristic of the Hellenistic and Roman periods, consisting of geometric designs in shades of red, purple and ochre-yellow on a white background. The geometric motifs present a combination of intersecting, bright red-painted patterns delineated within black lines. The second group of motifs is composed of floral elements, such as leaves, branches and wreathes. These differ from the fresco fragments of the first group in their free and expressive execution and they seem to have required a higher level of artistic skill. The decorative motifs are schematic and devoid of details. The colors are more intricate, mostly shades of green, yellow and red. One may assume that the floral motifs of the second group adorned the main part of the composition, on the walls of the rooms or on architectural elements; whereas the geometric motifs appeared on the upper and lower border panels or on the doorjambs and lintels. Remains of mosaic floors were discovered scattered among the ruins and it was clearly apparent that they were used in the rooms of the second story that collapsed. The tesserae were produced from indigenous limestone in a variety of colors: red, pink, yellow, gray, white and black. Sections of the survived mosaics consisted of small stones, indicating a high degree of expertise on the part of the artisan (c. 140 tesserae per 10 sq cm). The motifs that adorned the mosaic floors included geometric patterns, namely triangles, squares and rhombuses, as well as meanders and guilloche patterns. Columns and capitals were discovered scattered amongst the rubble of the second floor. Their use is unclear but it is assumed that they supported the ceiling of a gallery or balconies located on this floor (for analogies, see Ward-Perkins J.B. 1981. Roman Imperial Architecture. Harmondsworth. Pp. 206–210). The openings of two underground reservoirs were incorporated in the peristyle courtyard: the northern consisted of two chambers (c. 50 cu m) and the southern had one chamber (c. 38 cu m). The built walls of the two reservoirs were coated with several layers of hydraulic plaster. They were covered with large stone slabs that were laid atop a series of stone arches. The source of water for these reservoirs was the rainwater that drained from the roof of the building. The enormous amount of roof tiles found in the building’s collapse shows that the entire roof was tiled. The vast roof drained the rainwater into gutters that conveyed it to the reservoirs. The bottom part of the gutter, descending from the roof, was next to one of the corners of the courtyard and the pipe connected to it, which conveyed the rainwater below the courtyard pavement to the northern reservoir, was discovered in situ. Two distinct phases were discerned in the peristyle courtyard. The area enclosed within a peristyle was a garden in the original phase. Throughout the courtyard, several low stone columns less than one meter high were discovered; one of them was found in situ, embedded in the northwestern corner of the courtyard. The top of the column was wide in relation to its diameter and it seems that it served as a platform for some object that stood on it and was not preserved. Another low stone column was discovered in situ adjacent to the doorjamb entrance of one of the rooms in the northern row that bordered the courtyard. Its upper surface was dressed in such a way that a flat stone circle was left protruding on top of the column. Three other similar columns were discovered lying in the courtyard. Unlike the massive bases and columns in the courtyard that were part of the peristyle, these low columns were clearly of no constructive significance. Presumably, they were used as stands for objects that decorated the garden, such as stone vessels, bronze artifacts and sculptures, none of which had survived. Similar peristyle gardens were discovered in many of the houses in Pompeii. Some prominent examples are the House of Vetti, the House of Sallust and the House of Dioscuri. The gardens in the Pompeian houses were adorned with decorative ornamentation of the kind cited above (W. Jashemski 1979. The Gardens of Pompeii. New York, pp. 31–34). Modifications were made to the courtyard during the second phase of its use. The garden was negated and a white plaster floor, which adjoined all sides of the peristyle and completely sealed the garden below it, was installed. Apart from this, the courtyard’s original characteristics were maintained. During the fourth century CE, the building was struck by a seismic tremor, whose results were clearly noticeable in the excavation area. The walls of the rooms gave way and the stone collapse, which had piled to a considerable height, covered the downstairs walls, some of which still remained standing to a substantial height. Architectural elements, including columns and capitals, as well as mosaics and a very large quantity of fragments belonging to the frescos that adorned the rooms on the second floor, were discovered in the ruins. The coins discovered in the collapse and on the later floors show that the building’s destruction should be dated to c. 360 CE. It seems that the archaeological evidence reflects the results of the earthquake that had struck our region in 363 CE. This quake is documented in a contemporary historical source, which describes the places that were affected, including Jerusalem (K.W. Russell 1985. The Earthquake Chronology of Palestine and Northwest Arabia from the 2nd through the Mid-8th Century AD. BASOR 260:37–59). It was determined that the building was constructed at the end of the third century CE. The later coins discovered beneath the original floor levels were dated to the first century CE; however, the coins that were found inside its walls established the date of its construction to the Late Roman period. Noteworthy among them are Roman provincial coins, the latest of which is a coin from the reign of Diocletian (Alexandria mint; 285 CE). The finds discovered on the original floors of the building (below) clearly corroborate this date for the construction of the building. Consequently, the structure was used for a relatively short time, from its foundation in the latter part of the third century CE until its destruction in the fourth century CE. During its existence, minor changes were made to the structure, apparent in raised floor levels, which in most of the downstairs rooms numbered three or even four floors, placed one atop the other and insignificant building additions. As previously noted, two distinct building phases were also discerned in the courtyard of the building. Further proof of the building’s Roman character is attested to by the relatively large quantity of legion roof tiles that were found in the collapse. Some forty roof tiles that bear stamped impressions of the Tenth Legion, including one complete specimen, have so far been collected. The architectural wealth, the plan and especially the artifacts discovered in the ruins are unequivocally Roman in character. Noteworthy among these finds is a marble bust (Fig. 9), a gold earring inlaid with precious stones, a semi-precious gemstone bearing the likeness of Cupid and terra-cotta figurines and bone plaques engraved with mythological scenes. The date of the building’s construction at the end of the Roman period, its plan, architectural features and the artifacts discovered in it indicate it was part of the Roman city. The still unsolved issue concerns the question of the building’s function. Was it a private residence or possibly, a public building? Although no finds that point to either of these two options have been discovered to date, a comparative analysis of its plan actually supports the first possibility. With the exception of single examples such as the peristyle building from Sepphoris (Talgam, R. and Weiss, Z. 2004. The Mosaics of the House of Dionysos at Sepphris, Qedem 44) and the one from Apollonia (Roll, I. and Tal, O. 2008. 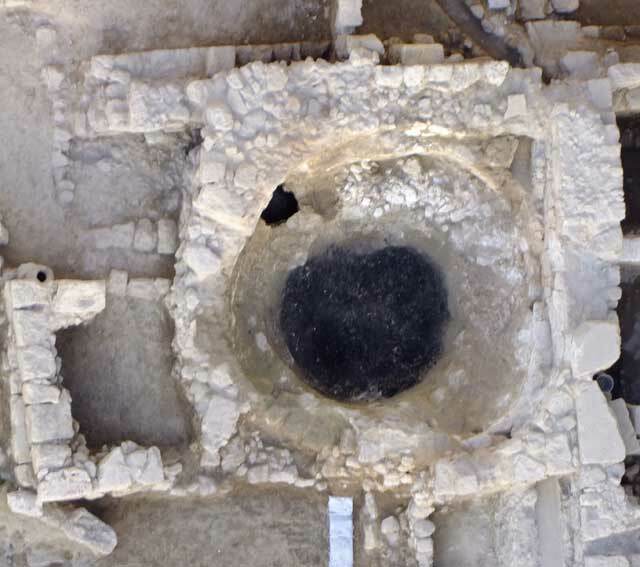 A Villa of the Early Roman Period at Apollonia-Arsuf, IEJ 58: 132–149) there are no buildings from the Roman period in the country whose plan resembles that of the structure discovered in the Giv‘ati Parking Lot. The Roman-period buildings at ‘En Yael, in the region of Bet Guvrin and elsewhere throughout the country (S. Appelbaum 1989. The Roman Villa in Judea: a Problem. In: Judea in Hellenistic and Roman Times. Leiden, pp. 124–131), have the characteristics of a Roman country villa (villae rusticate) and are quite different in essence and plan from our building (J.T. Smith 1997. Roman Villas. A Study in Social Structure. London and New York). Similar contemporary buildings are located far to the north, in sites that were excavated in Syria and are dated to the second–fourth centuries CE. These are the ‘urban mansions’ of the Roman period that were discovered in Antioch, Apamea and Palmyra. Their plan was borrowed from the world of Hellenistic architecture and adopted by the local elite as a model that was preferable to the plan of the residential house with a peristyle courtyard, surrounded by stoae (R. Stillwell 1961. Houses in Antioch. DOP 15: 45–57). The traditional plan of the Roman residence is gradually abandoned and that of the peristyle building superseded it. The Syrian peristyle buildings covered a large area, oftentimes in excess of 1,000 sq m, and were decorated with wall paintings and mosaic floors with spectacular patterns. The dates of the building’s construction and destruction are very important. In addition to determining the time of the ceramic assemblages discovered in it, these dates provide firm evidence and add an important contribution to understanding the process of expansion and the scope of Roman Jerusalem. The founding of a large peristyle building in the northern part of the City of David spur in the third century CE credibly reflects the expansion of construction in the period of Aelia Capitolina to this part of the city. 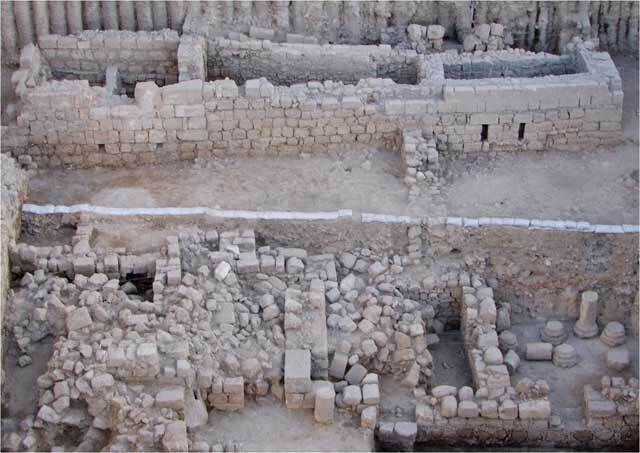 Until the discovery of the Roman building in the Giv‘ati Parking Lot, it was thought that the City of David lay outside of Aelia Capitolina (Tsafrir above, p. 161). The assertion, accepted by most scholars, was primarily based on the absence of architectural remains that could be ascribed with certainty to the Roman city. Along with the negative archaeological evidence was the absence of a clear line of fortifications that demarcated the city from the south. The assumption that this line was hidden beneath the line of the Ottoman city wall (Tsafrir above, 141, 161 and references therein) further emphasized the City of David spur as being situated beyond the populated area of Aelia Capitolina. This widely held belief was based in no small part on historical evidence. 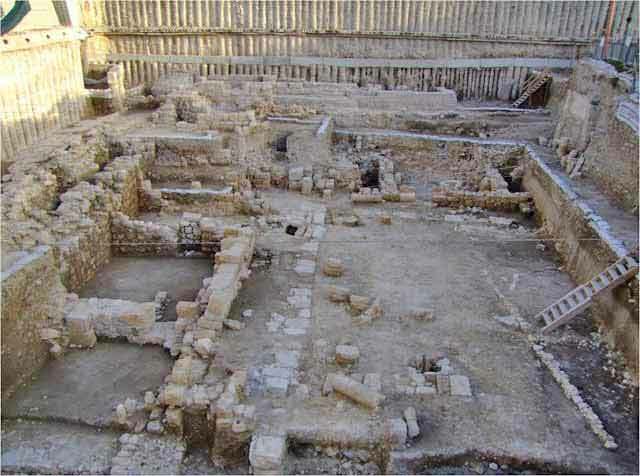 Unearthing the Roman peristyle building in the City of David greatly contributes to understanding the scope of construction in the Roman city of the third–fourth centuries CE. This is archaeological evidence of paramount importance with regard to the settlement’s expansion to the southern sections of the city in the latter part of the Roman period. The results of the renewed excavations in the City of David have invalidated the assertion that the hill of the City of David remained outside the limits of the Roman city at the time of Aelia Capitolina and that the entire region was used as a quarry to provide raw material for the houses of the Roman town (K. Kenyon 1964. Excavations in Jerusalem, 1963. PEQ 96:13). The peristyle structure discovered in the City of David shows that the southern hill, or at least the western edge of the Tyropoeon Valley, witnessed a renewed building boom in the late third century CE (Fig. 10). A miqwe and an adjacent cistern were discovered beneath the remains of the peristyle courtyard of the Late Roman period. These join the array of water installations, including another cistern, two miqwa’otand a bathtub, which were discovered in Area M1 (HA-ESI 120). Like the other miqwa’ot that were exposed to the south, the miqwe in Area M2 was also dug into the ancient strata. It was lined with stone walls that were coated with several layers of hydraulic plaster. Five of the stairs, leading down to the immersion pool, were exposed in their entirety. The pool itself is located beyond the eastern boundary of the excavation area (Fig. 11). The southern wall of the miqwe was shared with a large cistern situated to its south. The cistern, renovated and made higher in the Roman period, was used as one of the reservoirs for the Roman peristyle building (above). The installations discovered in the 2008–2009 seasons are part of the wing for ritual bathing that leaned against the northern side of the large building, which was excavated in the previous season in Area M1. It was ascertained that the wing for ritual bathing extended across a much greater area than was estimated. It was bounded on the south by the large building it was meant to serve. Its eastern border was a wide wall, like the eastern wall of the building to its south, which was also built especially wide, serving as a retaining wall to hold up the slope. The western and northern borders of the wing have not yet been exposed. 1. The excavation area, aerial photograph, looking south. 2. 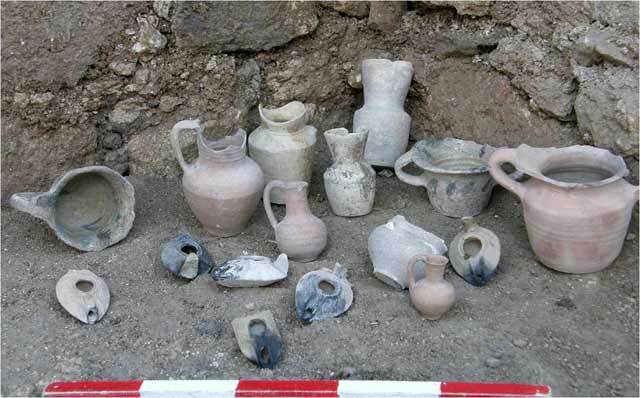 Pottery from the Abbasid period. 3. Limekiln from the Byzantine–Umayyad periods, view from above. 4. The Byzantine-period building and collapse of the Roman-period building, looking north. 5. The Byzantine period, plan. 6. The street in the Tyropoeon Valley, looking south. 8. The Roman-period peristyle building, plan. 9. 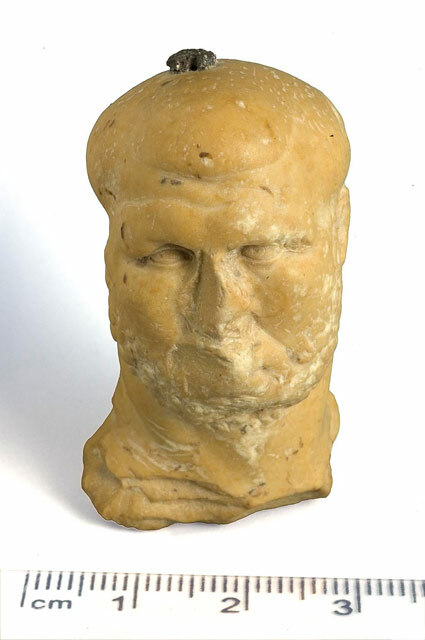 The Late Roman period, a bust (weight?) in the image of a boxer. 10. Roman peristyle building, looking north. 11. The stairs leading to the miqwe, looking west; on southern side, the cistern’s ceiling.